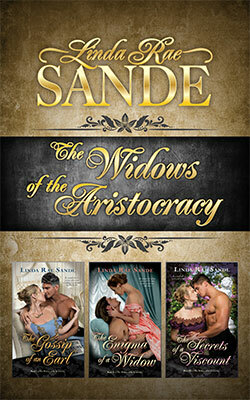 Three full-length sensual Regency romances make up this boxed set about a trio of widows. Extra! Extra! Read all about it ... in THE GOSSIP OF AN EARL, The Earl of Fennington has a secret identity—that of Mr. Pepperidge, editor of London's premiere gossip rag, The Tattler. While attending a garden party as Fennington, he meets and falls in love with Lady Emelia. The attraction is mutual, for despite knowing better, she allows him to kiss her behind a hedgerow. Who will know but them? Why, Mr. Pepperidge, of course! Desperate to spend more time with Emelia, Fennington employs a bit of blackmail to force Emelia to meet with him. Disguised as Mr. Pepperidge, he insists she provide him the on-dit she hears in Mayfair parlors. That, or he'll print the news of her kiss with the earl in The Tattler! With mistaken identities ruling the reports in the rag and a new Gossip Goddess sharing news of obscure aristocrats, is it any wonder the members of the ton love to hate gossip? Or do they really love gossip? When a widow just out of mourning returns to her position as a operative with the Foreign Office, she's assigned to help another spy regain his abilities after his experience with the horrors of war. What she doesn't know is that he's been assigned to her for an entirely different reason. Deception and intrigue highlight THE ENIGMA OF A WIDOW, a sensual tale of two spies with the same insane assignment—each other. Nothing makes a man more lonely than his secrets. The same might be said for women. THE SECRETS OF A VISCOUNT finds Godfrey, Viscount Thorncastle, with a secret he’d rather not tell anyone, including the woman for whom he has held a candle for over twenty years. Elise, the widow of Lord Lancaster, has had enough of marriage, but pining for the chance at motherhood, she may just have to consider Godfrey’s proposal. If he can just get it right. The man has some preconceived notions about his true love, none of which are true. But then, she has some of the same notions about him. And none of them are real! Misunderstandings must be overcome in this sensual tale of secrets and numbers.